UP LT Grade Teacher Result 2018 – 2019 UPPSC LT Grade Written Exam Merit List: Result is under processing and is supposed to release in coming days. The result will not be made available offline through post or any other mode. Candidates are advised to stay calm and to have a little more patience. Candidates have to get it downloaded from the official website of UPPSC. 2 How to check UP LT Grade Teacher result online? LT grade teacher written exam was held in July 2018 across 1760 exam centers established in the various locations of the state. Around 4 lack candidates appeared in this exam. It has been seven months and UP LT Grade Teacher result is still awaited. This is the reason examinees are a little bit angry as it is the matter of their future. But we advised to candidates to have patience and keep preparing for interview round as a result will be out soon. Quick Update 18/03/2019: UPPSC has released the Provisional list of selected candidates for Asst. Teacher (Trained Graduate Grade Men/Women Branch) for Agriculture and Music Subjects. Candidates can check it from below links. For the convenience of students will update all the necessary details and updates regarding UP LT result here on the page. Till then they can go through the article shared below to get important information about the result. UP LT grade teacher result 2018-2019 is expected to release soon. Candidates are advised not to worry about the release of the result as UPPSC is working on it. They also do not need to search various websites to access the result, they can visit either the official website or this page to get their result. The result will be released as select list and candidates have to search their names in the list. Examinees can search their result subject-wise. They must keep essential login details with them at the time of accessing the result. They require these details to log in the result page. How to check UP LT Grade Teacher result online? Examinees have to open the official website of UPPSC (http://www.uppsc.org.in) in a browser of their choice. On the homepage, they are required to click on the “Results” link. Now, they have to click on the description indication UP LT Grade Teachers result for viewing the result. They have to select their respective subject. They can see a result sheet on their screens. Lastly, they can download the result PDF for future correspondence. 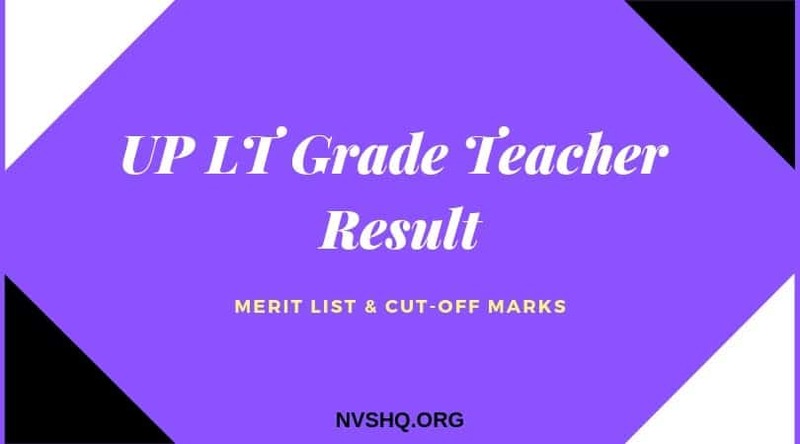 UP LT result is supposed to release in the form of a select list or merit list. It means the result PDF will include the names of the selected candidates who have qualified the written examination. UP LT 2019 result PDF is likely to include following details such as name of the selected candidates which could be in the order of merit, roll number of the candidates, subject name, category of the candidates, date of birth, post for which they have applied, marks obtained, total marks, marks percentage, result status and instructions. Candidates are suggested to bring all the issues and queries related to result or recruitment process to the notice of the commission. Candidates scoring less than Minimum efficiency standard marks will not be considered eligible for this recruitment process and will be disqualified. However, mere qualifying written examination does not indicate that the candidate is entitled to the respective post. Examinees must score equal or more than the minimum qualifying marks set by the commission to be eligible to appear in the next round of the selection process. Procedure after UP LT Teacher Grade result? Selection of candidates for LT teacher post will be purely based on the performance of the candidates in the written test. However, for final selection, interview and document verification will also be considered. Candidates who will score more and will satisfy the minimum efficiency standard will be called for the interview round. Those who will be shortlisted in interview round will have to go through the document verification round. Candidates will be notified about interview & document verification dates, time and venue through the official website and emails. On the basis of complete selection processes, a final selection list/ merit list will be prepared and will be published on the official website. Lastly, UPPSC will allot appointment letters to the finally selected candidates. UP LT result will be related on notified dates. Candidates have to check the result through the official website. The result will be made available through offline mode. No hard card of the result will be issued to any candidate. Candidates can check their result subject-wise. Candidates must fulfill the minimum efficiency standard criteria to qualify the written examination. All the examinees looking for the result are advised to regularly visit the official website for all the updates and announcements related to the result. Examinees can also bookmark this page by clicking Ctrl+D button simultaneously for latest updates and viewing UP LT result. If you have any query in regards to UPPSC LT Grade Result and merit list then you can comment below and we will answer it asap.